We recently had Sunday Lunch at The Punjab in Lapta and while talking to Riaz I realised it had been a long time since I had been to his other restaurant – Jashan’s in Karaoğlanoğlu, so we promised we would pay him a visit there very soon. We decided on a Monday evening which we thought might be not so busy as we wanted to learn more about Riaz and his businesses. This was not the case as the restaurant was busy throughout the evening but Riaz was able to spend some time with us in between meeting and greeting his customers and making sure everyone was happy. We chose a table near the nice log fire and had a few words with Riaz before looking at the menu.. There is an excellent choice and as a vegetarian there was plenty to tempt me. We had a lovely starter and main course which were all very well presented and, more important, it was all delicious. Chris was especially taken with his Lamb & Lentil Soup which he said was very different and extremely nice and I was very pleased with my main course of Vegetable Korma, it was lovely. We finished with a coffee and brandy and I must say it was a lovely meal in very nice surroundings, what more could you ask. 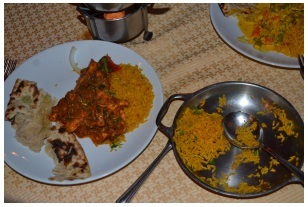 Many thanks to Iftikhar, the chef, for preparing such a lovely meal for us. In between courses we had an opportunity of speaking with Riaz – (Mohammed Riaz Malik) – and he told us about himself and his life in North Cyprus. Riaz was born in Pakistan in 1974 and he came to North Cyprus in 1995 where he found a job as a waiter at Jashan’s Restaurant which was then situated in Edremit. This was the first Indian Restaurant to be opened in North Cyprus and it was a Turkish Cypriot who actually started the business in 1995. In 2002 the owner decided t o give up and Riaz took it over and in 2004 he moved the restaurant to its present location on the main road in Karaoğlanoğlu. The building was previously a house and Riaz converted it to a restaurant which now has 2 dining rooms and a nice bar area. The upper floor of the building is where Riaz lives so he doesn’t have far to travel to work! Riaz has 4 brothers and between them they not only run Jashan’s but also The Punjab in Lapta which opened in 2009 and Jashan’s in Bahceli/Esentepe which opened in 2010. So it is very much a family business between the 3 restaurants. We spoke about the many other restaurants in North Cyprus which are run by people from Pakistan and Riaz said that some of these are cousins and there are some from the same village he came from. We know tha t in the Pakistani community there are many who are related and so we found we also knew some of Riaz’s relatives as well. We asked Riaz about his family and he told us that he has 3 children, a daughter aged 12 and 2 sons aged 10 and 8, they all lived here in North Cyprus but his wife has now returned to Pakistan with the children to continue their education and cultural studies there. I wandered outside to have a look at the garden area and one thing struck me immediately which was the parking area is right at the front and between this and the restaurant there is a large terraced area for summer dining, so there is no traffic noise in the restaurant which is a good distance fro m the main road. The terrace area has a nice bar and there is a large fountain which I would think when operating in the summer months must give a very tranquil atmosphere for the diners on the terrace enjoying the warm summer evenings and most of all the excellent food. We asked Riaz the meaning of the word “Jashan” and we were told it is an Urdu word meaning celebration. 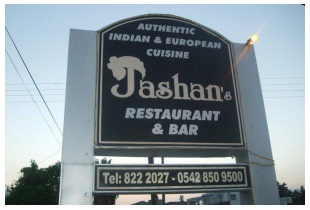 Although this is a very nice translation I would say you don’t really need to wait for a celebration to visit Jashan’s, it is a nice place to go at any time to enjoy excellent food, good service and a friendly welcome. Riaz asked us to say “thank you” to all of the customers who have visited his restaurant over the last 18 years. To read more of Riaz Mohammad Malik and his lovely restaurant in his website by clicking here. Riaz loves to take pictures of his guests and if you use Facebook you may find your picture by clicking here.